Harbor Heights Cottage has a premier setting right on Stonington Harbor in the quaint fishing village of Stonington, in the areas best kayaking waters. Ample rocky shoreline and crushed shell beach islands are just offshore and only minute's kayak ride away from Harbor Heights. This charming home is nestled on a gently sloping hillside, boasting gorgeous views of the harbor and many surrounding islands, including Isle au Haut (part of Acadia National Park). Lounge on the wrap-around porch and enjoy southerly and southwesterly views, including beautiful sunsets. Relax on the spacious dock, granite ledges, gardens, and beach area or slip into one of our EIGHT kayaks. Tour the harbor or surrounding close by islands in the areas most prime kayaking waters. View the array of lobster boats and glorious sailing vessels as they pass in and out of the harbor - easily seen from inside as nearly all rooms have an ocean view. The open floor plan has ample natural light, with kitchen, breakfast nook, spacious LR and dining room. Large french doors overlook the harbor and open to the deck. The master BR and bath are on the main floor (with glass doors opening to deck) and 4 additional bedrooms and bath upstairs. The home is decorated with antiques and local collectibles while having all the modern appliances to make your stay comfortable and convenient. All wood flooring further accentuates its charm. The home is very well supplied, including quality bedding. Enjoy time with friends and family as this house accommodates sleeping for nine, yet cozy enough for just two. While originally from Maine, we currently live in Florida. We bought this home in 1998 to be able to spend more time near our family. When not there ourselves, we love sharing the home. It's a great location, a warm environment, and the kayaks are just such a treat. The nearby islands are fantastic to explore. We've worked very hard to make the home enjoyable for our guests, and it is fully supplied with everything you should need. We also try to have laundry, dish and dishwasher detergent, tin foil, baggies,etc....all those sort of things you don't want to have to buy for a short stay. We also put in comfortable and quality bedding. While not "fancy" - it's a great house!! Having grown up in Maine, but now living in Florida, I was homesick! So we bought a fixer upper and the whole family pitched in and helped us fully renovate this former 'lobsterman's family home'. With very few homes actually waterfront on Stonington Harbor, this home was unique and really special. This home is right on the harbor, and only a few minutes walk to downtown. And the dock is fantastic....we have 8 kayaks to use! This is the best location for kayaking out to the nearby islands. We have many return guests...so I guess they like it as much as we do! On a side street just before the main downtown area. Only a two minute walk to downtown. Small beach at lower tides, better beaches nearby. Great area for putting in kayaks, looking for shells, sea glass, and sealife. Located on small side cove that is part of Stonington Harbor. Wide view of harbor, downtown, lobster coop and out to nearby islands. Table w/ extra leafs seats 6, dining nook w/ extra seating for 4. Additional chairs. In addition to our property, we also own the lot /large grassy area next to the home, which has additional parking, too! 8 Kayaks with oars located on dock (one is a double so there is seating for 7) & life jackets, picnic table, lobster pot, etc. Lovely spot on the harbor, fully equipped home, great host, and kayaks galore! We had a wonderful time ... better than we could have imagined! Barbara was a fantastic host who responded quickly to every question, has filled her lovely house with everything you could possibly need, and a bevy of kayaks on the dock ready for exploration in the archipelago of islands just beyond the harbor. We were only there for 2 nights and all 6 of us wished we were there for longer and agreed we’d easily return. Lobster etc is easily available, either from the dock or through a woman whose name is on the refrigerator! Evenings on the harbor were delightful, made even more special by the twinkly lights (and tea lights) one of our group had brought from home to adorn the deck. A little slice of paradise. 19 Seabreeze is a great place to rent! The location is perfect, the house and the view are amazing! We have rented the house twice now. The private dock and the kayaks are a major plus. We jump off the dock at high tide and use the kayaks often. Restaurants and shops are walking distance away and the sounds of the harbor lull you to sleep. There is plenty of room for guests and the deck over looking the harbor is roomy enough for meals outside and socializing. We highly recommend 19 Seabreeze Ave! This house is in such a quaint and beautfual area. Right on the water, as close as you can be to the lobster boats. We bought lobster right off the boat one evening. It was fantastic. The house is an old home that is pretty well maintained. A little bit of detailing could really push this house to the next level. Several areas had paint chipping off the ceiling, deep cleaning needs to happen around door handles, light switches, and buttons on microwave and dishwasher (visibly dirty). The main floor bathroom’s toilet was never cleaned from the guests before, so we had to clean it when we arrived...this may have made me a bit more sensitive to all other areas. Overall, that was the only major cleaning fluke. One other suggestion would be for the owners to write up instructions for guests. It would be helpful to know where the outside trash is, what to do with the recycling, how to work TVs, kayaking instructions, etc. The owners were present when we arrived so they gave us a lot of information verbally that could be helpful if written down for guests (especially about the emergency bag for kayaking). Although the other areas are mentioned, they are definitively not deal breakers on this house. Great views, updates, and decor. Definitely a place for those looking for a quiet secluded vacation. You can basically get all you need within walking distance. The town is very cute and has some great restaurants. If you are looking for a busy tourist location in Maine this is not it, this will be for those looking for a restful experience where you can really see the fishing industry in action. We truly enjoyed our stay. Glad you enjoyed your stay. Sorry if you felt any deficit in the cleaning. We (the owners) were there the two weeks before your stay and worked our little fingers to the bone preparing and cleaning the home. We'll definitely get our glasses on next time and see how we can step it up further. Thanks for staying with us. Loved the town of Stonington. We are an active family of four and hiked and kayaked like crazy the week we were there. Other family members that were sharing the house are not active, so the were quickly bored with the limited shopping available. This is not a tourist-trap town, it is a working lobsterman and granite quarry town. The house was in a great location, we would stay here again! Great location, clean and convenient mfortable! We selected this Cottage as our home away from home to explore Deer Isle, and Acadia. It was a wonderful residence, overlooking the harbor. Beautiful sunsets and at night you could hear the fog horn in the distance, from the point. It is within walking distance from at least three local restaurants and an ice cream store, small park and coastal discovery wharf for the kids. They also enjoyed the kayaks in a small inlet behind the house that was out of the way of harbor traffic. The kitchen had everything you could need and the bedrooms and baths were very comfortable. It was nice also to have a washer and dryer so we could keep up with laundry. It is a quaint, period home with all modern conveniences. We would certainly stay again! Awe. Just what we hope, happy renters enjoying our home and our gorgeous area. Thanks so much for sharing our home with us and being such wonderful guests! Sweet house on the harbor that has 5 Bedrooms! 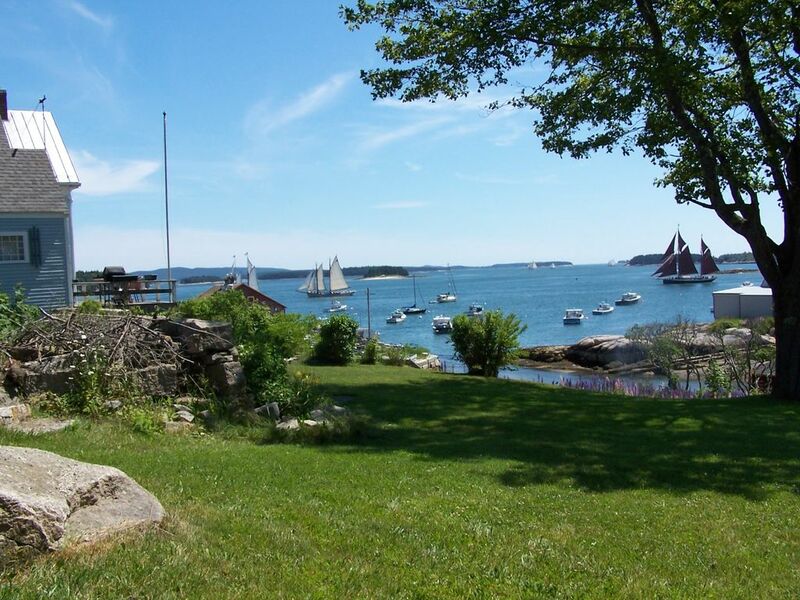 Sweet house with beautiful views of the Stonington Harbor across the entire back of the house. Whether over morning tea or evening wine the combination of assorted boats and Maine sky should not be missed. The bedrooms are small but comfortable (all except the Master- big and spacious on the first floor with stunning views as well). There is a a nice back balcony and deck with large table, as well as a cute little front porch. You can walk everywhere in town from here. Loved our stay! The home is particularly well situated to kayak out to nearby islands beckoning for exploration. Two minute walk to downtown shops, galleries, museum, restaurants and much more.